I know, I know, I know....once again I'm back saying it's been way too long! And to be honest, me not blogging regularly is just one way I'm self sabotaging myself. I keep telling myself every week that I've got to get back to this. I need to get back to my meditating, journaling, and blogging. Not only for myself, but I started this blog to help inspire and motivate others. Well, today I did some meditating at lunch and my thoughts led to self-sabotage, and not only for what that means for me personally, but why do we do this to ourselves? We all do it in some way. So, just to get you up to date on what's been going on. I am still at Fitness Together, but he is in the process of going down to one location. He's closing the downtown studio, but keeping the Riverside studio. What does this mean for me personally? Well, it means I'm back to 5:15 AM workouts because now I won't be able to make the drive to the studio while at work during my lunch break. But, that's okay, the change I believe will be good for me. I just started the new schedule, as well with a new trainer he hired, and I'm actually feeling a lot better. I have found that on the days I get up early (3:45 AM), that not only do I feel better once I've done the workout, but it starts my day off better. To be honest, since the first of the year I have been making changes in training schedules and trainers just trying to find what works, but it seems I never truly found that balance I needed. I think there were times I thought what I was doing was better, but I think really I was just trying to not be a burden and just get in there and do my workouts. But, even in just these last couple days I'm already seeing and feeling that it's going to help me be more consistent in my schedule by getting back down to the Riverside studio early mornings (I'll have my routine all week), I like the new trainer, and I'm actually using my lunch to just create space for myself by reading, meditating, journaling, etc. So, today like I said, I started to think about self-sabotage. This is something I'm constantly doing it seems like, and I think in general we all tend to do this to some degree. I mean it's like, we start feeling great about ourselves and what we're doing, and so what do we do? We somehow get in our own head and start creating chaos that leads to us doing the things that cause us to self-sabotage. To each of us those things are different. For me personally, what I was thinking is how these past few days I've been getting back to some basics. Like meditating and journaling, doing the early morning workouts, and even the simple things like drinking my water like I should. I feel amazing and I do so much better in my workouts when I get up early and workout, drink my water throughout the day like I should, and make those healthy eating choices. I stopped running so I'm back to square one training for a half marathon in December, even though once I've gone out and run I always feel so much better. So why is it that I stop doing these things knowing that I'm going to feel physically horrible, which leads to me feeling mentally and emotionally drained? Because this is what I tend to do, I self-sabotage when things are going good and I'm feeling good! But, that stops today! I'm not saying I won't have bad days because I'm not perfect, but it does mean I'm going to be more self aware of the things that trigger me to self-sabotage. So what I encourage you to do is what I did. I took the time to just reflect on the things I do that make me feel good, as well as how I feel when I don't do them. Then, I made a note of what I need to do to make sure I'm not going to get in my own head and cause that unnecessary chaos. 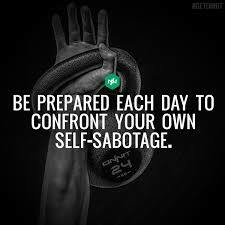 And then I'm going to do exactly what the picture quote says, I'm going to be prepared each day to confront my own self-sabotage. I'm going to do this by staying focused on my goals. I've been so worried about what could go wrong with all the changes, that I didn't allow myself to see the opportunities with the changes.